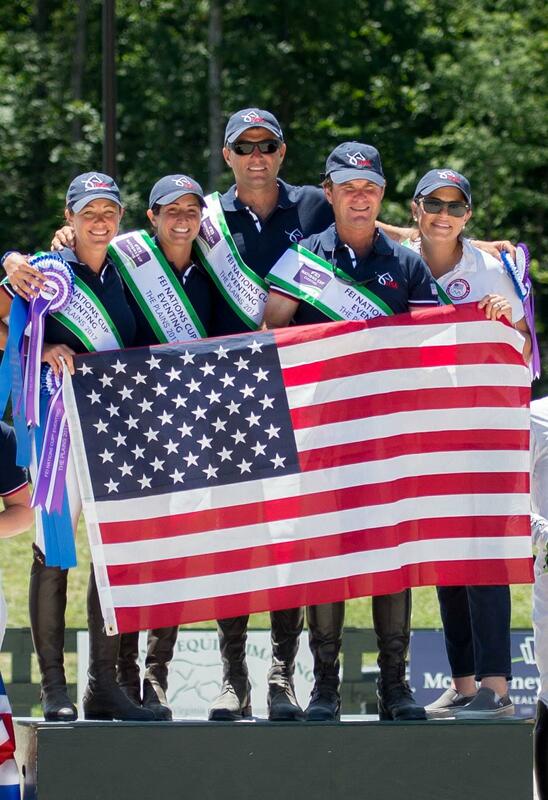 The Plains, Va. – The Land Rover U.S. Eventing Team won the FEI Nations Cup™ CICO3*at the Great Meadow International, presented by Adequan, for the second consecutive year. The team of Jennie Brannigan, Lynn Symansky, Phillip Dutton, and Boyd Martin defeated teams from Canada and Great Britain in the only FEI Nations Cup™ Eventing competition outside Europe. Brannigan also captured her second individual title at Great Meadow, having won previously in 2015. Cross country course designer Mike Etherington-Smith reversed the direction and order of the fences from last year with the intention of generating interest for both the competitors and spectators. The change proved to be challenging for some,though not for the U.S. team. All four riders completed the course without any jumping penalties. Brannigan had an unforgettable day. The Reddick, Fla. resident went third in the team order and secured the victory for the U.S.incurring only 1.6 time faults on Nina Gardner’s Cambalda. Brannigan came into the final day in fourth place and catapulted to the top spot with a final score of 49.8 penalties. By the time second U.S. team rider Lynn Symansky took to the course, two riders were eliminated from the British team and the Canadians had already secured a team score. The Middleburg, Va. resident jumped clear, finishing just above the optimum timeon Donner, owned by The Donner Syndicate, LLC. They incurred 1.2 time faults for a three-phase score of 50.1 penalties, which was good enough for second place individually. Symansky was originally the alternate, but was named to the team after Buck Davidson, Jr. withdrew Carl Segal and Sherrie Martin’s Copper Beach. U.S. pathfinder Boyd Martin of Cochranville, Pa, was the first rider to complete the course within the optimum time of 6 minutes and 33 seconds, finishing within two seconds at 6:31. Riding Steady Eddie, owned by Denise Lahey, Pierrie Colin, George and Gretchen Wintersteen, the Olympic veteran finished on his dressage score of 58.3 penalties. Dutton, of West Grove, Pa., already knew that the U.S. had won the Nations Cup prior to going out, but an individual win was on the line. Riding Kristine and John Norton’s I’m Sew Ready, thesix-time Olympic veteran finished outside the optimum time adding 5.6 time faults to his cumulative score of 51.6 penaltiesand putting him in third place.